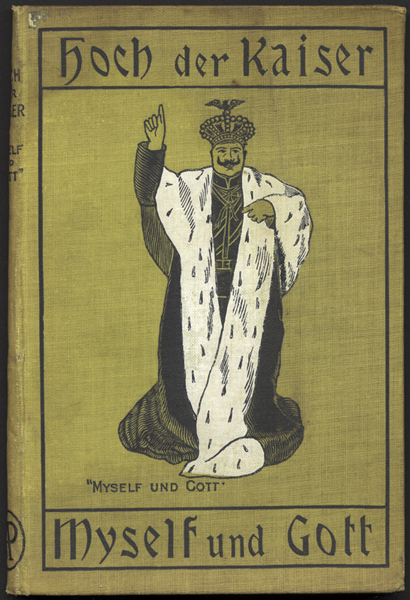 Hoch der Kaiser : Myself und Gott / by A. McGregor Rose (A.M.R. Gordon) ; the pictures by Jessie A. Walker. - London; New York; Montreal : Abbey Press, [c1900]. Air raid precautions : an album to contain a series of cigarette cards of national importance / W.D. & H.O. Wills branch of the Imperial Tobacco Company (of Great Britain and Ireland), Limited. - [London?] : W.D. & H.O. Wills, [1939?]. Follow the dots, color the pictures. - Akron, Ohio ; New York : The Saalfield Publishing Company, c1943. Soldier : coloring book. - Akron, Ohio ; New York : The Saalfield Publishing Company, c1943. Hit the mark! : a play book. - Akron, Ohio : Saalfield Publishing Company, c1943. Sailor : coloring book. - Akron, Ohio ; New York : The Saalfield Publishing Company, 1943.